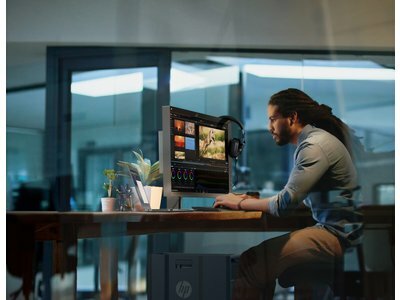 Create a dual-display mobile workspace almost anywhere with the HP EliteDisplay S140u 14" USB Portable Monitor, an ultra-compact, strikingly thin, high-resolution display in a wraparound cover. Fold it back to add a second screen for your Windows tablet or notebook and connect with one USB cable. 8.6" x 13.6" x 0.5"
Create a dual-display mobile workspace almost anywhere with the HP EliteDisplay S140u 14" USB Portable Monitor, an ultra-compact, strikingly thin, high-resolution display in a wraparound cover. Fold it back to add a second screen for your Windows® tablet or notebook1 and connect with one USB cable. Pair the 1600 x 9002 high-resolution display with a notebook or tablet1 to extend to a dual-display setup wherever you work, or make a big impression with mirror mode. Get ready in a snap with the single USB cable that also acts as a power source. Fold back the cover and connect to any USB3 port on your notebook or tablet1 and you’re ready to work. Rest assured that your IT investment is supported by a three-year standard limited warranty. To extend your protection beyond the standard warranties, select optional HP Care Pack Services. Be a better consumer with a display that has environmentally responsible components that include low halogen, arsenic-free glass, and mercury-free backlights. 1 Windows operating system tablet or notebook required. See product QuickSpecs for exact compatibility requirements. 3 If connecting to a USB 2.0 port, connect both ends of the USB “Y” cable to two USB 2.0 ports.